We are fans of very bright lights for our offroad adventures. For many years we've sung the praises of the 8" Ricky Stator halogen and HID race lighting systems for serious night riding like that occasionally required in the Tour of Idaho. The Ricky Stator 8" HID light remains a racing favorite here for it's brightness, color temperature and beam pattern. Big race lights all have one disadvantage and that's weight. Our RS unit weighs around 5 lbs with the frame, ballast and wiring harness. That's a lot of weight way up high and out front - weight that you can feel in technical terrain and especially when picking your bike back up after dumping it in technical terrain. We set out this year to evaluate some lighter weight lighting systems for use in the Tour of Idaho, where ounces really count. One of our first calls was to Trail Tech, who previously supplied us with a pair of SCMR16 HID auxiliary lights. These lights have proved to be extremely reliable over many years, and the minor issue we've had with them (both ballasts going bad once) have been fixed by TT without question. Our SCMR16's have served us very well in nearly every Tour of Idaho and beyond. 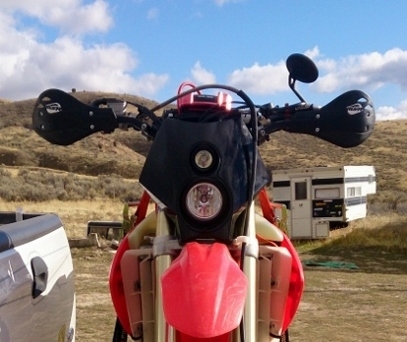 Trail Tech's Joshua Barton suggested that we give the TT X2 HID system a try. While we will almost certainly use that system for the 2014 T1, we opted for now for the street legal (but not DOT stamped) dual sport, hi/lo halogen X2 that features an adjustable clipped beam to avoid blinding other vehicles on the road. The 70 watt halogen X2 system is pretty lightweight at 28 oz. The sturdy plastic housing contains a 4" SCR lamp and a 2" SCMR16 lamp. The nice thing about the halogen system is that it will, of course, work with DC or AC systems. The bulbs dim to match stator output, but the system is pretty bright even at low rpm. The X2 comes in a model-specific kit with the proper fork mount and connectors for most any bike. A separate wiring harness with a nifty hi/lo/off/kill switch is available as an accessory and we obtained one with our kit. The light comes in a variety of colors and a graphics kit is available as well. 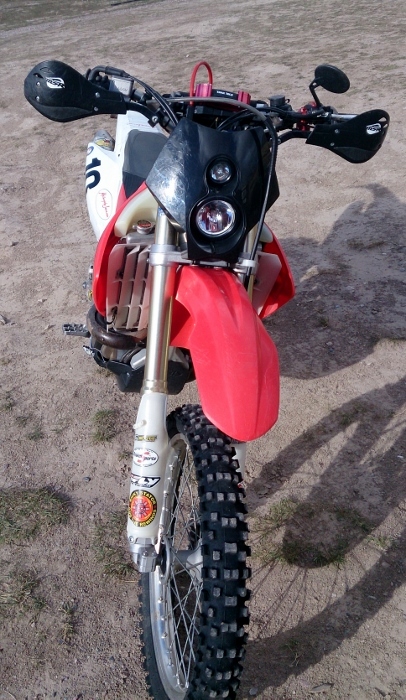 After several months of hard use we are well-pleased with our X2 kit, which has proved to be very rugged and brighter, even in the dual sport version, than we expected it to be (some of this is due to the fact that we are running a high-output stator in our CRF450X). The beam patterns, for their intended purposes of getting one out of the woods and home on public thoroughfares, are just fine. 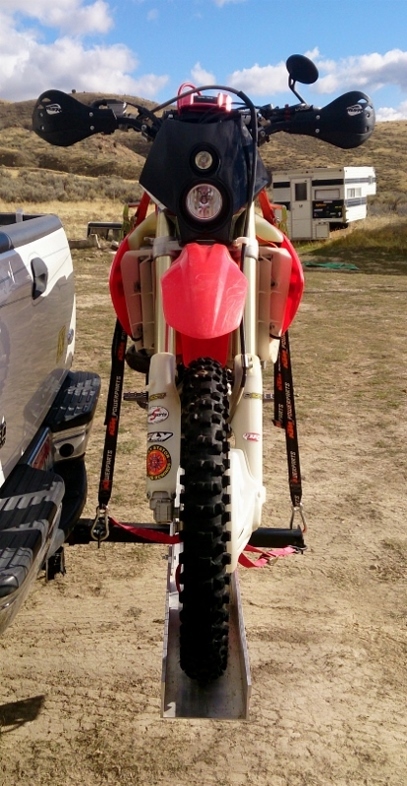 The X2 snugs up tight against the forks of our CRF and is much less obtrusive than a big race light. The difference in heft is noticeable while riding the bike, and most definitely noticeable when hoisting the bike off the ground. When the going after dark gets really gnarly, we add our auxiliary SCMR16 helmet lights to the mix and we've been good to go so far. We'll have an opinion on the X2 HID light after the 2014 Tour of Idaho. Stay tuned. The Good: Very light weight (28 oz). The Rad: Plenty bright and versatile enough for most uses. The Gnarly: Rubber mounts may have to be flipped on some bikes to avoid extra steering lock.